The Smith river, named after legendary explorer Jedediah Smith, is situated mostly in California, although headwaters of the North fork are in Oregon. This river makes a fine boating destination in the rainy season, offering a wide variety of sections to choose depending on flow conditions. As levels rise, you can always go higher up, or try some of the side creeks. Being the largest undammed river in California, flow conditions fluctuate freely, so you could run the same section many times and encounter different rapids each time. See the Smith River for Rafters and Kayakers for great pictures and writeups. With headwaters mostly in well-managed national forests, water on all forks of the Smith is generally crystal clear, even after heavy rains. Being in a seldom-logged pygmy forest, the north fork is exceptionally clear; at times you get the feeling of being suspended in air as you float swiftly over gravel bars. The run below Gasquet is too short to be satisfying, unless you do it twice, combine it with something else, or include it on a travel day. The road is almost always visible, and there are some paddles across flatwater. Most rapids are simple drops thru gravel bars. There is one class III- ledge drop a little over halfway down; at most flows this is best run on the left side. Class IV boaters often continue into Oregon Hole Gorge and take out at the South Fork Road bridge, or further down at Jedediah Smith State Park. 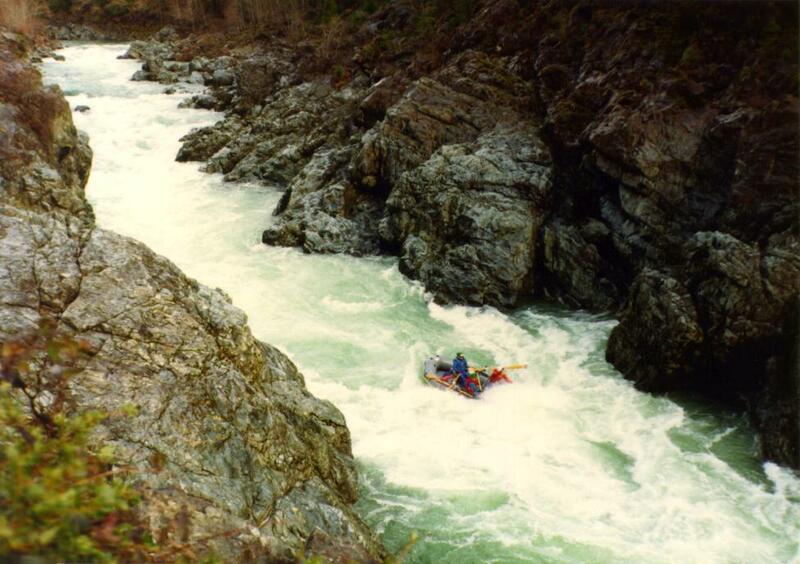 Inflatable kayakers who attempt the gorge at high flows, as shown in the pictures below (not recommended), usually end up swimming a long distance. To reach take-out, drive one mile east of Hiouchi, pass the South Fork road, and proceed just beyond the tricky gorge drops that are visible from the highway. Park at the next turnout, where a trail descends to the river. 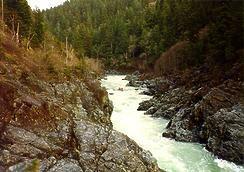 Walk down to the river so you can recognize the take-out and avoid blundering into Oregon Hole Gorge. To reach put-in, drive about six more miles east on 199. Parking and river access (a wide trail down to the water) are available on a peninsula near the Gasquet store and laundromat.